Hurrah and that. Such was the bestsellingity of the first two editions of Tiny Campsites, that a third will be on its way in spring 2017 – I’m even now researching it, pounding the roads of Britain on my Raleigh Winner. For the time being, here’s a pic of the second edition, which sold out some time ago so good luck getting one cheaply on t’interwebs. It’s still got its own website though, which is nice. Dans le meantime, those of a nostalgic bent may gaze on the cover of the first edition, brought out at a time when grass was still nationalised and if a gentleman wished to own a tent he had to make one out of his own skin. 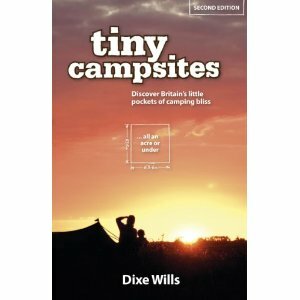 where can i buy the tiny campsites book? I’m very sorry but I’ve only just seen your comment, over a year after you made it. 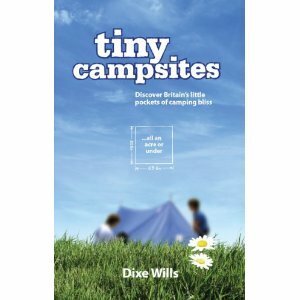 The third edition of Tiny Campsites came out on 1st April 2017 and is available pretty much everywhere. It’s published by the AA.